Sleep apnoea is a serious condition that can affect your quality of sleep and your overall health. It causes your airway to temporarily close, stopping you from being able to breathe. The first symptom of obstructive sleep apnoea (OSA) is usually snoring. 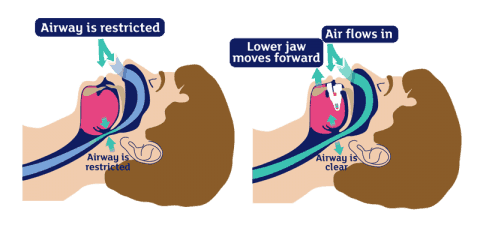 Snoring is caused by a narrowing of the airway, particularly at the back of the throat. If your airway narrows too much when you’re asleep, the air you breathe is then pulled through it faster. This causes the soft tissue in the back of your throat to dehydrate and vibrate. The sound you hear is what most people know as snoring. In some cases, the airway becomes so narrow that the walls of the airway stick together and close up. This usually happens for 10-30 seconds but can occur for longer – sometimes up to 50 times an hour or even more. When the airway finally opens up again, you’ll produce a loud, violent snore. This is known as an apnoea. Sometimes the airway may not fully close, but becomes so narrow that you experience an oxygen drop in your blood. This is called a hypopnoea. Frequent apnoeas and hypopnoeas mean you most likely have OSA. Am I at risk of sleep apnoea? Sleep apnoea can affect people of any age or gender. Lifestyle factors such as smoking, being overweight, and a lack of exercise can all increase your sleep apnoea risk. Women are also at higher risk of sleep apnoea after the menopause. Here are a few factors that can trigger sleep apnoea. Being overweight. Excessive fat around the neck can put pressure on the airway, making it more difficult to breathe. Being male. It’s unknown why, but sleep apnoea is more common in men than in women. Being 40 years of age or over. Although sleep apnoea can occur at any age, it’s more common in people over the age of 40. Alcohol. Drinking excessively can lead to weight gain, which significantly increases the risk of sleep apnoea. Having a large neck. Having a collar size of 17 inches (43cm) increases the risk of developing sleep apnoea. Smoking. Smoking increases the inflammation and fluid retention in the upper airway which causes breathing difficulties. Menopause. The changes in hormone levels during the menopause can cause your throat muscles to relax more than usual. Family history. If sleep apnoea runs in the family, there may be genes inherited from your patents that can make you more susceptible to sleep apnoea. Nasal congestion. Sleep apnoea occurs more often in people with nasal congestion. Have I got sleep apnoea? It’s possible to suffer from sleep apnoea and never even suspect you have the condition. The symptoms are often spotted by a partner, friend or family member who notices problems while you sleep. Sleep apnoea can be complicated to diagnose. One of the main signs of the condition is loud snoring, but not every snorer has sleep apnoea. When you experience an apnoea during sleep, you will usually snore continuously followed by a period of silence and then a loud snore or snort. Sometimes the airway may not fully close, but becomes so narrow that you experience an oxygen drop in your blood. This is called a hypopnoea. Hypopnoeas are harder to detect than apnoeas, but they can be recognised by persistent noisy or laboured breathing when asleep. OSA is a medical condition. This means that you don’t necessarily ‘have’ sleep apnoea until you get a medical diagnosis. You might experience the symptoms of sleep apnoea without them being enough to support a medical diagnosis. Either way, if you suspect that you have sleep apnoea, it’s a good idea to discuss this with your doctor. There are also several serious medical conditions related to OSA. Evidence suggests that sleep apnoea can lead to high blood pressure. High blood pressure can increase your risk of serious medical conditions, such as heart disease and stroke. You can prevent high blood pressure by maintaining a healthy weight, exercising regularly and eating a balanced diet. You can also prevent high blood pressure by using the appropriate treatment for your sleep apnoea. Can I still drive if I have sleep apnoea? Another common treatment option for OSA is an Oral Device. They are sometimes called mandibular advancement devices, snoring mouthpieces, or snoring mouth guards. These devices are similar to gum shields, and they work by holding your jaw forward (or simply stopping it from falling backwards) during sleep. This helps to keep your airway open, stopping it from collapsing during the night and helping you to breathe easily and quietly. Clinical studies show that Oral Devices are as effective as CPAP in treating mild-to-moderate sleep apnoea. If you have mild sleep apnoea, you can treat it by making lifestyle changes and using a mouthpiece like the Snoreeze Oral Device. These mouthpieces work by holding your jaw forward or stopping it from falling back during sleep. This helps to prevent your airway from narrowing and collapsing, so you don’t stop breathing in your sleep. You can find out more about how the Snoreeze Oral Device treats mild-to-moderate sleep apnoea by clicking here. If your sleep apnoea is severe, the best treatment for you will most likely be a CPAP machine (although some people find that an oral device still works for them, or works well in combination with CPAP). Your doctor will be able to advise you on the best way to manage your sleep apnoea.